Footscray Mechanics’ Institute. Founded 1857. This building constructed 1913. The Mechanics' Institute movement began in British urban industrial centres in the early 1800s. A "mechanic" was a person applying skills and technology. During the 19th century, most towns in Victoria established a Mechanics' Institute or Athenaeum with a library and meeting hall. Common objects were the "spread of useful knowledge" and provision for "rational recreation" in the community. 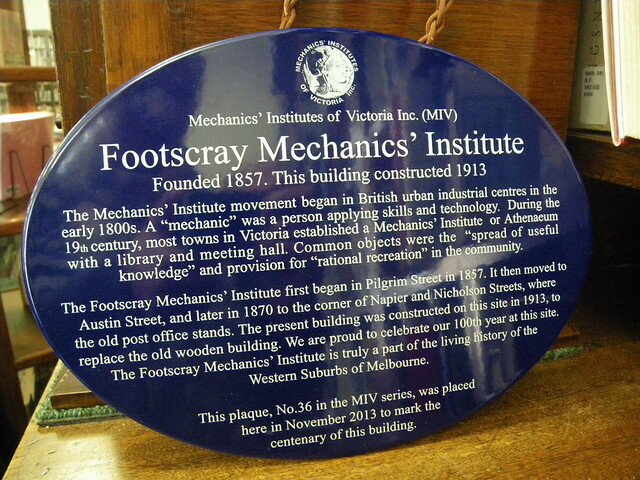 The Footscray Mechanics’ Institute first began in Pilgrim Street in 1857. It then moved to Austin Street, and later in 1870 to the corner of Napier and Nicholson Streets, where the old post office stands. The present building was constructed on this site in 1913, to replace the old wooden building. We are proud to celebrate our 100th year at this site. The Footscray Mechanics’ Institute is truly a part of the living history of the Western Suburbs of Melbourne.